Here we will introduce a recipe for a type of OKONOMI-YAKI, called BUTATAMA using pork. This introduces a recipe for OKONOMI-YAKI. 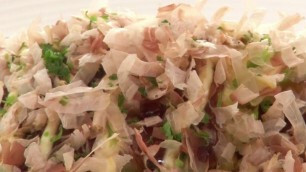 The ingredients include OKONOMI-YAKI flour mix, cabbage, green onion, sliced pork belly, eggs, and the toppings: sauce, mayonnaise, katsuo-bushi(dried, fermented, and smoked bonito) flakes and dried ao-nori(green lseaweed) flakes.